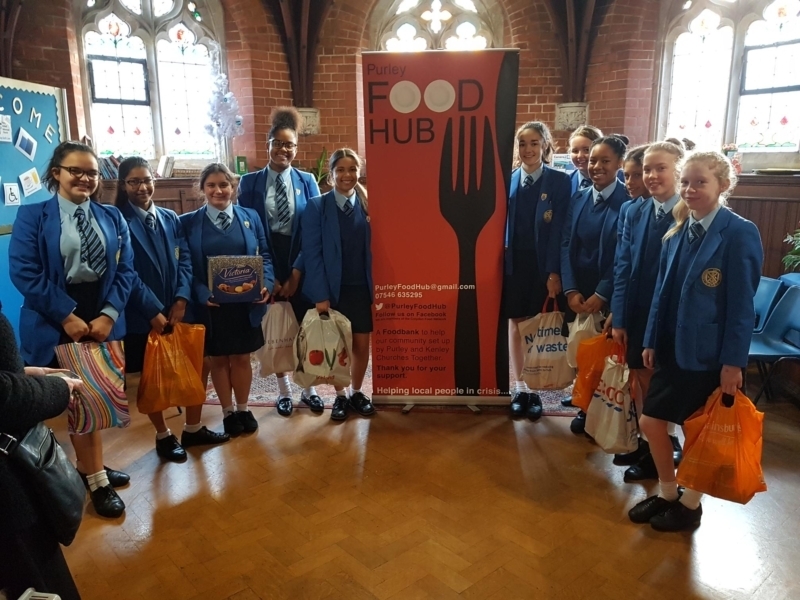 Throughout December 2018, Year 9 decided to take on the project of collecting food for the Purley Food Hub. They liked the idea of a backward advent calendar where you give rather than receive and in their forms they took turns to bring in supplies. Year 12 were also collecting for the Food Hub and on the 18th December we picked up their food as well as ours and took the minibus to the Food Hub to find out more about what goes on. Once we had unloaded all the food, a representative explained to us that they are referred families who cannot afford to buy food. They give these families three meals a day per person and other necessary supplies. As it was the Christmas period, they also had some biscuits for children who would not otherwise enjoy these luxuries. They also have food for those who turn up hungry and unannounced. The girls in Year 9 who came to represent their forms were so moved by these stories that they are preparing an assembly for their year group with the intention of giving more regularly and initiating an on-going project. Representatives from the Food Hub were impressed by our girls and their generosity and we all feel that a very positive relationship has begun.